Today was the final test for my aerial installation and I’m pleased to report that everything went well. This morning, David, M6DHU and myself wrapped up warm and ventured out into the garden. We first lowered my 40m dipole and moved it out of the way then we proceeded to apply some anti-bird measures to my Cushcraft MA5B. We fitted around one hundred cable ties around the elements, boom and stub mast which I’m hoping will persuade the birds to perch somewhere else. I also adjusted the beam because previously the low SWR point on 20m was just out of the top of the band. Once all was done it was time to lift the mast back into place using just the winch. Just to be on the safe side, M6DHU held a ladder under the mast to take the weight should the unthinkable happen but in the end that wasn’t needed. It only took a few seconds of winch winding and the mast was back in the preferred vertical position and the restraining arm fitted to the stand-off bracket. 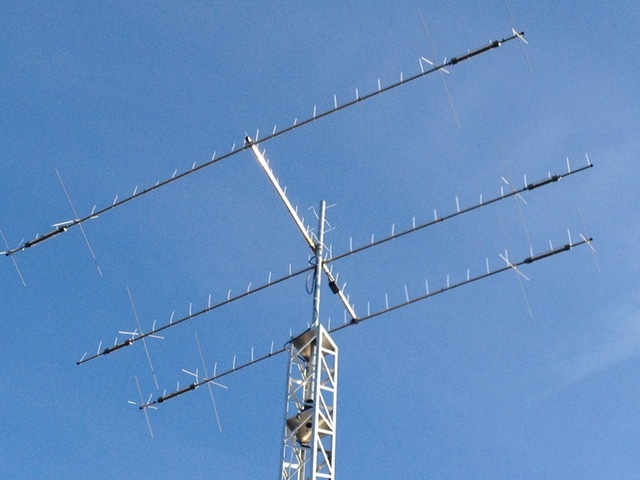 I’ve seen no birds perched on the aerial since it went up today although I did spot a couple of seagulls sitting on the television aerial next door looking jealously at my Cushcraft MA5B! I wasn’t able to put the dipole back up due to a minor breakage so instead I’ve reinstalled my OCFD which will have to do until the dipole is modified. I’m very pleased with the ease the mast winched back into place. It doesn’t look too bad, Bas. That was a closeup from the ground so it makes it look worse but the cable ties do blend in. Mmmmmm, did someone mention cakes ?